The term GURU define a special kind of teacher, one that knows and perfectly understands a specific art form. Milena Origgi’s Art form is the Voice and she is a Vocal Coach! Loving and caring for her voice since childhood, Milena understood very early that the Voice was her unique talent. Then her Voice became a powerful instrument, first to define herself, her identity and then the hidden Essence of her clients and students. She has even created a Training Method from her unique vision, naming it Inborn Voice. The Inborn Voice method deals in everything that is related to the Voice at 360°. I don’t work with the Technical aspect of the Voice alone. I go deeper and embrace the full potential that human Voice has to offer. According to Milena, our Voice is the only way we have to let people listen to us. By first listening to your own Voice, the same voice that everyone else can hear, but more importantly, by listening to your Inborn Voice, the one that lives inside of you and that only you can perceive, you start to understand who you really are and let the world accept that. It is important to learn how to live in awareness of your voice. It is achieved through the realignment between the vibration that lives inside us, our Inborn Voice, and the vibration of our voice in the outside world. It may seem like a path designed only for vocal professionals like singers, voice over artists and actors, but it works for everyone else as well. The method is really useful to anyone who want take back their voice or discover their real voice, to become assertive or to overcome big obstacles. When someone is interested in improving their voice, either the one they use to speak or the one they feel inside, I help them to express through their voice something that is exactly in tune to what they feel inside. This process is useful not only for singers, actors and voice over artists, but also for managers and everyone who relies on their voice to make a living, like therapists, psychologists, doctors, lawyers, moms, parents, couples. I started very young. When I was 6/8 years old, I became aware of my talent. But then, like everyone else, I followed an academic path, and when I was 25/26 years old I started fully committing to the world of voice training. Now I have almost 30 years of experience, but it all started with my extreme curiosity. It was my curiosity to meet different people, new type of sounds and vibrations, new languages, new accents and finally new emotions, that has driven me to continuously change the country that I live in. Now I think I will stop in Boston because it is one of the cities that I love the most. Milena’s first dream was to sing. But it was only in adulthood that she has fully understood that her talent was not related only to her own voice, but also to the voices of others. directly from the source: the Inborn Voice. Today, thanks to her career, she travels all over the World studying sounds and vibrations from different cultures. 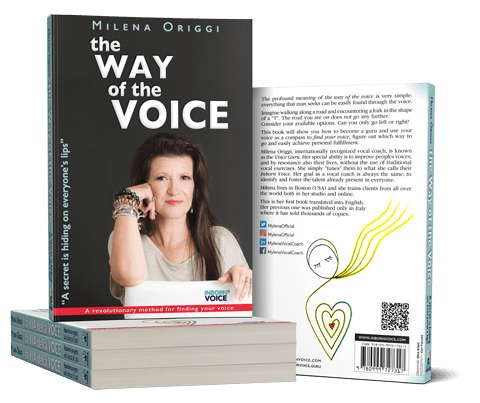 Thanks to her second book, soon available in English, “La Via della Voce”, she has made this new type of voice training available Online. Today Milena has conducted over 17,000 Vocal Coaching Session. In 2016 she was given the title of Topic Expert in Communication Techniques from the University of the Holy Heart in Rome. It is a Course that has been recently added to our University curricula just to give the students the opportunity to be prepared to speak in front of the public .They have to overcome stage fright and Voice Training plays a fondamental role in this. We are trying to introduce a new type of university course with the participation of business and vocal experts helping the students become aware of the powers hidden inside their voices. Vocal Coach, Topic Expert, Voice Guru, or Voice-Tuner, as she defines herself. She transforms the voice into the balance point between soul and body. I’ve been gifted with the talent of being a voice-tuner and in this role I understand what to do and when to do it to “fix” someone’s voice. I travel the world all year round and despite that I always had time for my wife, my sons and to play sports. My life is full of sports like skydiving, snowboarding, tennis, bicycling and archery. I met Milena over the Internet and I started with some suspicion, without giving her too much credit. At that time, I was not comfortable with my voice, but with every lesson I was more and more confident. She was even able to make me do what I considered impossible: sing! because my father was a good singer. Milena was able to instill in me the trust and the willforce to do it. through a path that identifies the talent hidden inside of their voice and emotions. All this allows for their inner self to bloom!